Two new MacBook Air models, the slim laptop produced by Apple, have been announced today at Apple’s World Wide Developer Conference (WWDC) in San Francisco. Boasting improved battery life, the models are priced as follows: The 11″ 128GB model is $999, the 11″ with 256GB is $1199, the 13″ with 128 GB is $1099, and the 13″ with 256 GB is $1299. The battery on the 11″ model will last 9 hours, according to Apple, with the 13″ model’s battery lasting 12 hours. In addition to improved battery life, the new MacBook Air will also feature enhanced wireless performance that is up to 3 times faster than the current MacBook Air models, with extended range capabilities. 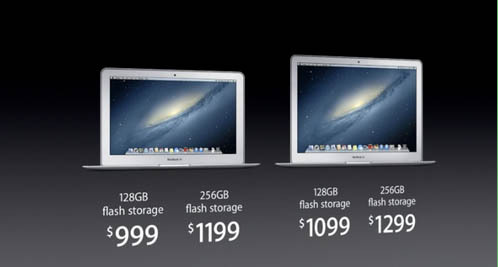 Both new models are available now on Apple’s website or in Apple retail stores.